Calumet and Delek have both rewarded investors well over the past 12 months. Is one stock better than the other at this point? Calumet Specialty Products Partners, L.P. (NASDAQ:CLMT) and Delek US Holdings, Inc. (NYSE:DL) have both witnessed large stock advances over the past year. However, the performances of these chemical and refining companies have started to diverge somewhat over the past few months. There's a good reason for this, but does that make Delek, the better performer this year, the better stock for investors? Over the last few years, Calumet has been refocusing its business, looking to shift more toward specialty chemicals. That makes sense, given that the commodity fuels business in which it operates provides relatively thin margins compared to chemicals. The partnership's gross profit per barrel of chemicals in the first quarter was $33.11 compared to a gross profit per barrel of fuel of just $7.49. However, the transition hasn't been an easy one. That's partly because of Calumet's heavy debt load. Although management has made a huge amount of progress in improving the partnership's leverage position, debt to EBITDA was still a heavy 6.6 times at the end of the first quarter. That compares to Delek's debt to EBITDA ratio of just 2.4 times -- even after Delek's recent acquisitions of Alon USA Energy and Alon USA Partners, moves that materially increased the company's scale. First-quarter results at Calumet, meanwhile, weren't nearly as inspiring as its efforts on the debt side of the equation. Notably, adjusted EBITDA in the specialty chemicals business was down 17% year over year. The fuels business saw a 5% improvement, but that wasn't nearly enough to offset the weakness on the chemicals side. Investors appear to be taking a wait-and-see attitude, pushing the shares down around 10% so far this year. Now add to this the fact that Calumet hasn't paid a distribution since the first quarter of 2016. It is structured as a partnership, which is meant specifically to pass income on to unitholders via distributions. 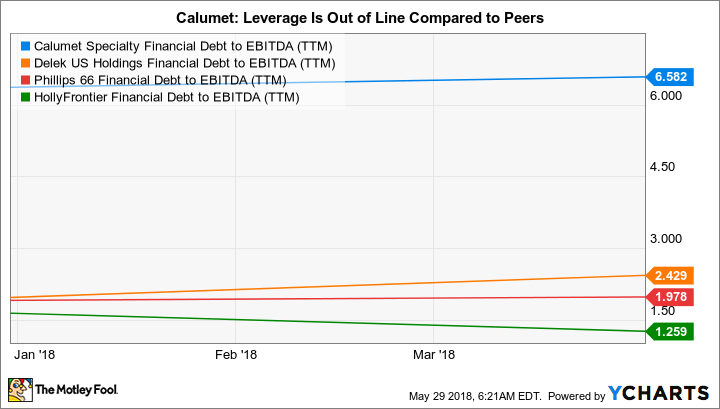 Although Calumet has made a lot of progress, it's only appropriate for more aggressive investors looking for turnaround situations. Most others should stay on the sidelines, at least until it starts to pay distributions again. As noted above, Delek has gone through some changes lately, too. However, it's in a much better financial position than Calumet. The debt to EBITDA discrepancy noted above is ample proof of that. But so, too, was the company's first-quarter update. CLMT Financial Debt to EBITDA (TTM) data by YCharts. Although adjusted EBITDA was up, year over year, it was largely driven by one-time items including tax gains. However, the company reported a number of positives. For starters, its heavy exposure to the Permian Basin is expected to provide it with ample low-priced oil, helping to bolster margins through 2019. It completed the drop-down of an asset to its controlled partnership, helping to increase its cash position to a robust $1 billion. And the board of directors announced that it was raising the dividend again. The dividend is no small issue, since the increase was an impressive 25%. But that hike came on top of a 33% increase in the first quarter. In total, the quarterly payout has increased from $0.15 per share a quarter to $0.25 -- a 66% increase in just two quarters. No wonder investors have pushed the shares nearly 50% higher this year. Clearly, Delek's efforts are paying off for investors. 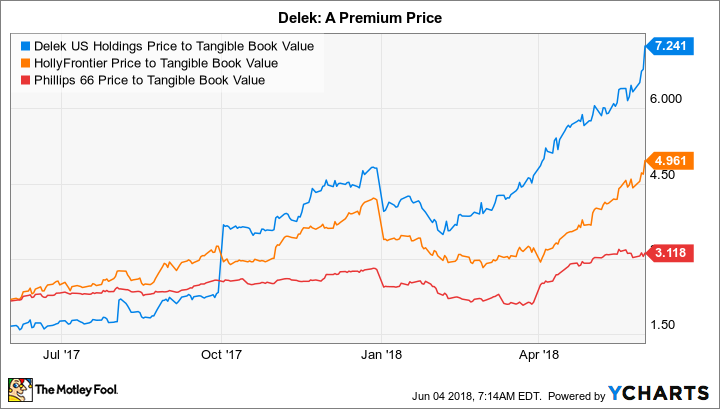 That said, Delek's price gain so far in 2018 has left its price to tangible book value ratio well above that of peers like HollyFrontier (NYSE:HFC) and Phillips 66 (NYSE:PSX). So, it's fairly easy to give Delek the nod over Calumet, but it's harder to suggest that it's the best option in the independent refining space. Investors should probably step back and consider a broader set of options. At the end of the day, Calumet remains a work in progress only appropriate for more aggressive investors. Delek, while much better off financially, has seen its shares advance notably this year. And while its efforts to enhance its business appear to have positioned it well for the future, investors have clearly taken notice of this fact. It looks relatively expensive today compared to others in the independent refining space, which suggests that it isn't a great buy at current prices. Neither Calumet nor Delek are clear winners, in my opinion.